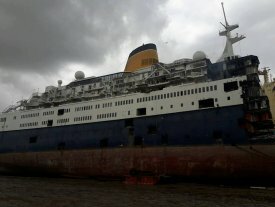 It was announced today that the last operational 1974 British built cruise ship ' Oasia ' had been sold to Indian ship breakers. This 24,492 grt cruise ship was built as the Norwegian operated ' Vistafjord ' and after a spell being operated by Cunard Lines was operated in her last years by Saga Cruises as the ' Saga Ruby '. She was withdrawn from service in 2014 and at the time it was reported she had been sold to be used as a hotel ship at Myanmar ( Burma ). This failed to happen but earlier there had been a planning appllication made to have her as a hotel ship, with time share and entertainment facilities, to be moored in the old Royal Docks area in London ! Her present owers had been based in Singapore and although the ship was reported as having been for sale and kept in very good operational condition, with a maintenance crew on board, there had been no buyers. It is expected she will now proceed from Thailand to India, using her own engines, to be driven on to and broken up on the beaches at Alang ! R.I.P. 1st picture below shows her as ' Oasia ' alongside in Thailand with most of her lifeboats and launches removed ! . 2nd picture is of her when sailing as the Saga Cruises ' Saga Ruby ' and at the UK port of Southampton between cruises. The ' Oasia ' has spent the last 24 hours cruising around off of the Thailand port of Sattship prior to heading towards the Indian ship breaking beaches. Maximum speed so far reached has been 8.5 knots ! After a few days of testing her engines and being re-registered in St Kitts and Nevis the ' Oasia ' has now sailed from Thailand waters with what is thought to be an indian crew on board from the ship breakers. Today she was heading down the east coast of Malaysia at between 8.5 and 9.5 knots and expected to arrive in Singapore waters this evening. As is usual on these voyages it appears her new crew have turned off the AIS system, or sold it , so her actual position is now not known but she should have passed through Singapore waters about last Friday and could be now heading across the Arabian sea to India and the ship breakers yards. Early this morning UK time the ' Oasis ' arrived off the beach where she will be run ashore and then stripped of items for sale before being broken up.